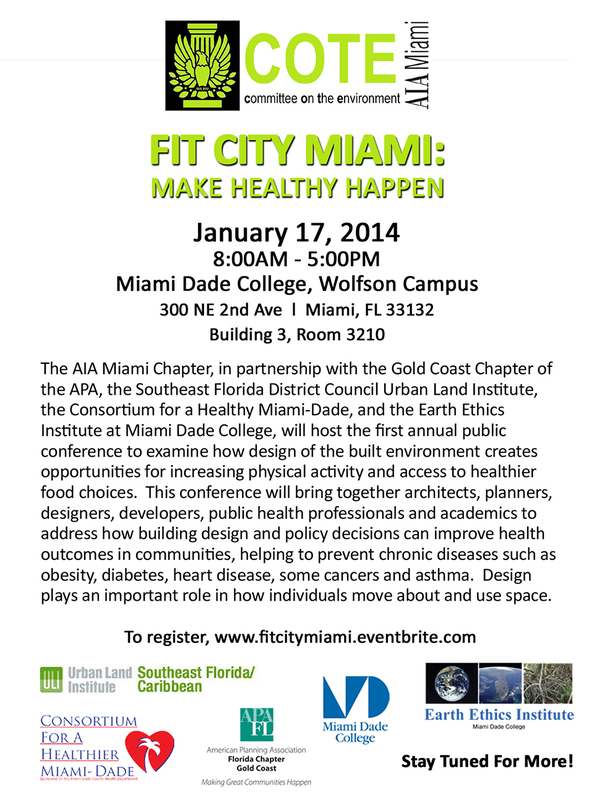 “The AIA Miami Chapter, in partnership with the Gold Coast Chapter of the APA, the Southeast Florida District Council Urban Land Institute, the Consortium for a Healthy Miami-Dade, and the Earth Ethics Institute at Miami Dade College, will host the first annual public conference to examine how design of the built environment creates opportunities for increasing physical activity and access to healthier food choices. This conference will bring together architects, planners, designers, developers, public health professionals and academics to address how building design and policy decisions can improve health outcomes in communities, helping to prevent chronic diseases such as obesity, diabetes, heart disease, some cancers and asthma. Design plays an important role in how individuals move about and use space.